Two Sri Lankan scientists who were to receive a prestigious award from the American Association for the Advancement of Science (AAAS) were informed that their selection was placed “under review,” two days after they were announced as the recipients. Sarath Gunatilake and Channa Jayasumana have long made the case that the chemical glyphosate, perhaps best known as the main ingredient in the widely used herbicide Roundup, is responsible for chronic kidney disease among agricultural communities. Jayasumana says the award was withdrawn due to corporate pressure from the agrochemical lobby; an AAAS official said concerns had been raised about the scientists’ findings and a peer review process would be carried out to evaluate them. A leading science advocacy group has suspended its decision to award two Sri Lankan scientists for their efforts to link a controversial weed killer to kidney disease, following a public backlash. 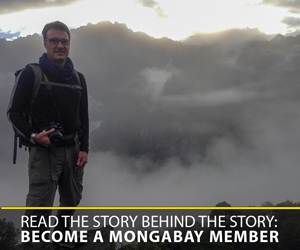 Jayasumana told Mongabay that he had received emails from the AAAS informing him of the review of the award selection. “We understand the immense pressure exerted by affluent agrochemical companies to negatively influence the emerging scientific evidence linking one of Sri Lanka’s worst public health problems to the agrochemical industry,” he said. Tiffany Lohwater, chief communications officer for the AAAS, confirmed that “[t]he award was not presented as originally planned while AAAS further evaluates the award selection. Gunatilake and Jayasumana, in their work, have long made the case that the chemical glyphosate, perhaps best known as the main ingredient in the widely used herbicide Roundup, plays a key role in transporting arsenic, cadmium and other heavy metals to the kidneys of those drinking contaminated water, contributing to the increasing number of cases of chronic kidney disease (CKD). Sri Lanka lifted the glyphosate ban in 2018, in response to weed-related crop losses in its tea industry, a key export commodity for the country. A scientist associated with the NASSL, speaking to Mongabay on the condition of anonymity, suggested that the initial decision by the AAAS to award Gunatilake and Jayasumana shouldn’t be seen as an endorsement of their findings, but rather as recognition of their work bringing the issue of chronic kidney disease among agricultural communities to light. “Recognition for scientists is not always offered for proof of outcome and it often was about the process of highlighting issues of scientific validity,” the scientist said. Banner image of workers in a field in Sri Lanka by Psychoslave via Wikimedia Commons (CC BY-SA 4.0).